DYNAMIK are excited to launch their new Sports Walling website this week. 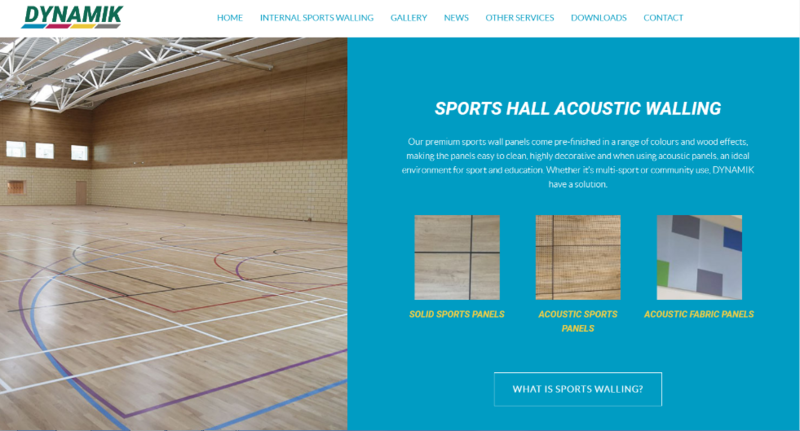 The new sister website featuring DYNAMIK Internal Sports Walling showcases how sports wall cladding is a premium yet cost-effective solution for your sports hall and can be specified in the early stages of your project or after installation. The new website aims to present the principle features of internal sports walling supplied in a variety of wood effects, solid colours or fabric finishes. DYNAMIK Sports Wall Panels have a high impact resistance, comply with fire regulations and meet acoustic performance ratings so are ideal for your Sports Hall, Arena or Community Centre. As Official Sports Flooring Partner to Basketball England and Indoor Sports Flooring Supplier to England Netball, DYNAMIK has installed at high performance sport arenas and community sport venues across the UK. Sports Walling is another string to their DYNAMIK bow. DYNAMIK provide free of charge no obligation quotations and surveys which are carried out if you are looking to upgrade or maintain your sports facility. We are happy to talk with you about your needs so contact us for more information on how we can help you. Visit dynamiksportswalling.co.uk today to find out more.